In 1983, I led a research team to Fiji to study fish in the area looking for clues to ancient distribution. We stayed part of the time on the island of Dravuni where the University of the South Pacific (USP) had a small research outpost. While there, living with the local people, we came to know them well. My wife was with us on the trip and she was quickly welcomed into the women’s circle. One of the skills they showed her was the making and decorating of Tapa. The finished cloth, called “Masi” is special. It has a symbolic and long-standing history in Fiji. 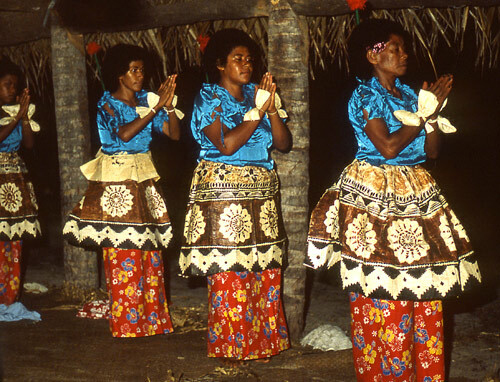 Indigenous Fijians, the Taukei, use masi today for most every ceremony. 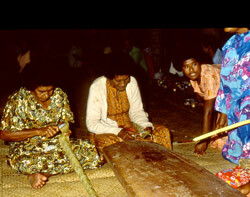 Masi is mainly produced mainly in a few south-eastern islands of the Lau group, and Viti Levu. We were on Dravuni (pronounced ndravuni]). This tiny volcanic island is in the Kadavu Group of islands and is the most northern of several inhabited islands within the Great Astrolabe Reef. Approximately 125 people currently live there, but when we were there the village only had about 60 people. Frances was invited to be part of a tapa-making event. The setting is in one of the larger houses where a large specially-shaped log is central and the various tasks are ranged around the log. Some are stripping bark from the stems, others are beating the park and still others are making the decorative and symbolic patterns on the finished bark. The process begins a with small tree, the Paper mulberry tree (Broussonetia papyrifera)that arrived in Fiji during the voyages of migration the hiapo or siapo from Southeast Asia. The tree is cut down and dried for a couple of days. Once at the proper half dry, half moist stage, the bark is stripped off. After the bark is stripped from the tree, the outer bark is separated from the inner bark named tutu or loututu. 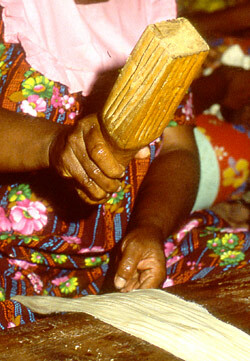 The strips of fibre are placed on a wooden anvil which is shaped from a very large log scraped smooth for the women to beat the tapa. Women beat the fibre on the anvil with wooden clubs. The clubs are specially made with some surfaces ribbed and others smooth to work the fibre from a coarse to a very fine surface texture. The cloth is repeatedly beaten and folded until about 1/2 meter wide. Then strips are overlapped and the joints are beaten until they become firmly “glued” together. The resulting cloth can be quite wide and is a soft white colour. 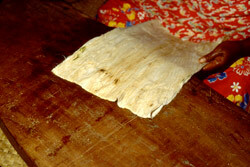 Once beaten and glued, the cloth is then dried in the sun. The cloth can be smoked over a sugarcane fire to produce the tan-coloured masi kuvui, or it can be soaked in mangrove sap, terracotta clay or specially prepared soot. Most of what we saw however, was left in its orginal white colour. 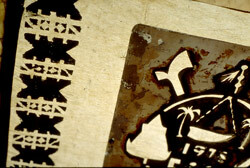 The stencils The designs used to symbolise Fiji are produced with stencils. 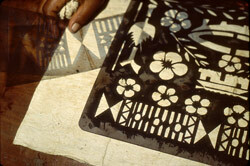 According to the local people on Dravuni, the stencils were originally made from banana or pandanus leaves. However, they now use, of all things, discarded x-ray negatives into which they cut the shapes to symbolize Fiji or that are traditional historical shapes. Each stencilled figure is sharply defined as the “ink” is applied to the bark cloth. We were especially interested to recall that fine decoration is not always a sign of status. The wedding attire of high chiefs is characterised by using more tan-coloured masi kuvui, together with very fine white masi. All of the skirts worn by our hostesses were brown on a fine white cloth — high honour indeed. seriously…its an easy tasks….everybody can do that….its true that it is very educational because that is from the olden days but we still kept it…. To Vuli….. it easier said than done and not everybody can do it. I am very doubtful that you will be bale to do it. That’s SERIOUSLY !!! i just found a very old pic of my very own namesake nd grandmother..
it is very resourceful and interesting.. I was wondering if there is a story behind each pattern on the Masi?, are they all different for families/makers?. Is there any way to find out the history of a specific pattern? Traditional Masi patterns and the arrangement of the patterns do indeed tell stories for those who can read them. 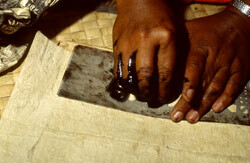 They also depict where in Fiji the material was made and designed and who made them. 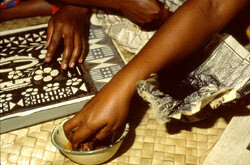 Traditional designs are drawn from everyday Fijian life. 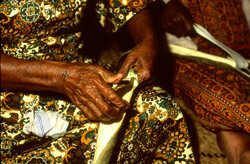 The Fijian toothed comb is one that is used extensively. In others one can see the shape and feel of the teeth of a barracuda. 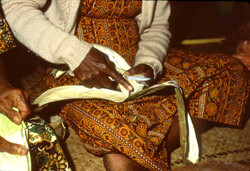 Masi was traditionally used only for chiefs and priests or for special occasions such as weddings and funerals. I expect that like Wampum belts in our country which are storytelling instruments, only the Elders who have been trained to read them can still do so. Many of the Elders in our country are passing down the interpretation of the wampum belts. Although I did not check this out while I was in Fiji, I imagine the same is true there – that Elders pass down the traditional knowledge through a combination of storytelling and instruments like the Masi that act as mnemonics for the story teller. 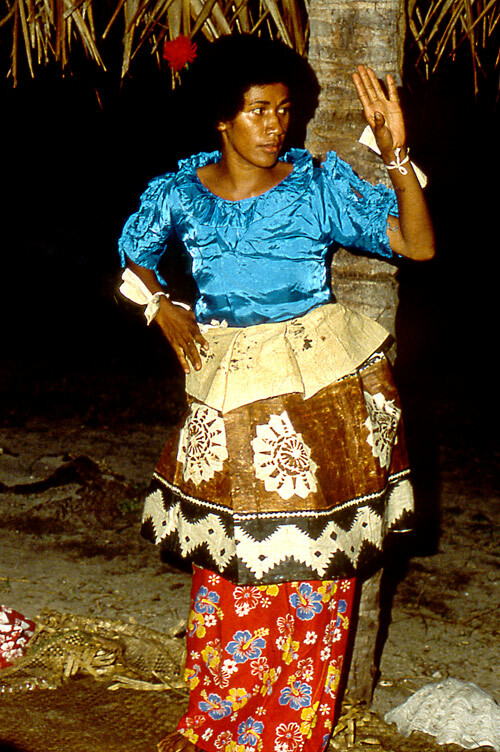 The patterns made for the tourist trade are primarily decorative but are derived from the traditional knowledge of the Fijian people. In your country (New Zealand) an airline is attempting to trademark its company with Masi patterns. While the outcome is uncertain, many native peoples have been able to successfully argue that the designs are specific to their culture, and while not copyrightable in our culture’s legal sense of an individual’s creation, they have been protected against pilfering by commercial enterprises. In Australia a number of aboriginal designs are not available to commercial enterprises. The “cloth” is made from the bark of the Paper Mulberry tree (Broussonetia papyrifera) and the inks used to colour the cloth are made from a variety of materials including carbon for the black and various plant dyes for other colours. The cloth can be smoked over a sugarcane fire to produce the tan-coloured masi kuvui, or it can be soaked in mangrove sap, terracotta clay or specially prepared soot. AWESOME…ONLY FOUND IN MOCE ND NAMUKA…..
Do you still need a lot of Tapa Cloths ? 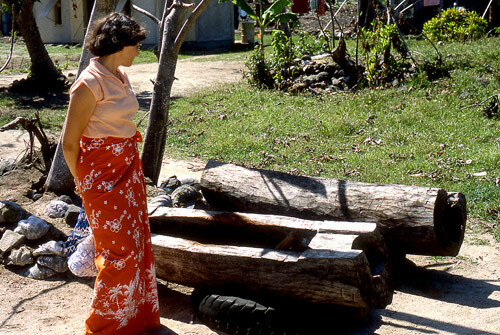 I am traveling to Fiji and will be able to visit the villages………….. if you still need some ? Just came across your request on this site. all over Fiji do Tapa making and im really happy thats its post on the WEB by an European which he really enjoyed his stay in Fiji and had something to say about Fiji…. what ink can i use to touch up on the tapa? Its really very educational and informative. I’ve always heard that it involves such a very hard and tiring work, especially in the beating of the stripped bark till it’s really flat and thin like that of a paper….anyway, thankyou very much for the helpful pictures and explanation explaining what is done in each stages. 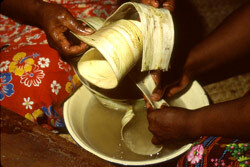 Apart from Namuka and Moce in the Lau archipalago, are there others from any parts of Fiji that make Masi? These pictures were taken in Dravuni. The materials had been stored in their houses for some time and they wanted to prepare a lot of Masi for their upcoming festivities. This is a very interesting piece of information! I am doing a research paper on masi cloth and just wondered if you recall how long it took to produce one masi cloth? Hi, I’m interested in buying real, authentic Fijian tapa cloths, do you know where? I have a tapa cloth 3.4 X 1.8 M that I got from one of our Island Air Hosted back in 1978 made by her Grand Mother. I liked it a lot! It will be really useful for my study project. Regards from Puerto Deseado, Argentina. My name is Cory Wanamaker, I am in expat artists who creates work as I travel. I just returned from Fiji where I was quite taken by the people. I was also interested in the patterns everywhere. In an effort to not appear to forward I didn’t ask anyone about the meaning or symbolism embodied in the tattoos. I thought it would be easy to find the information online, but I am finding it challenging. I felt a strong connection to Fiji and am in the research stage of creating a piece. Im finding many images but not much literature. Also, Im also finding information but mostly not specifically from Fiji. Would you be able or so kind to direct me to some information concerning the design and or meanings for specific symbols within the Fijian Tattoo (Tatatau) culture? Hi,my son lived in a fijian village for 6mnths in 2015,he brought home to New Zealand 2x large woven mats and a large Tapa cloth piece as a gift for us(parents)from the village and family he stayed with.He has moved on and we have these 3pieces.Is there anyone looking to buy woven mats or a Tapa cloth,just email me,i live in the waikato. yy dnt u try it urselves ,,,,,,,,…..
well fr me as a tru i-taukei i appreciate it……..
is tapa making originated in fiji or derivative from samoa or tonga?? Does any one know stories behind these masi designs/patterns? I just purchased 3 large tapa cloths in Fiji. As I was leaving the woman asked if I wanted her to varnish the cloth or I could wait until I get home to USA. Since we are hanging these on a large 3 panel tri-fold room divider I was wondering about what type of varnish and should I wait until it is hinge to varnish or varnish it first. I would wait until you get home and ask the advice of the framer as to the type of “varnish” to use, or if a more stable finish would be better. Hi, I have a tapa cloth my father gave to me, he has passed away and I never asked him why it was important to him as he had it locked away for a long time. I am not sure whether it is Samoan or Fijian? I have Samoan/Fijian heritage. Is there a way I can have this done.